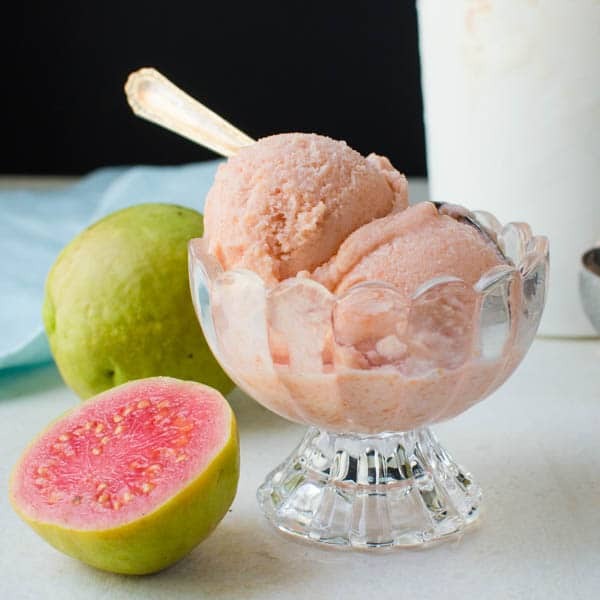 If you love tropical desserts and you’ve got guavas… make homemade sherbet. 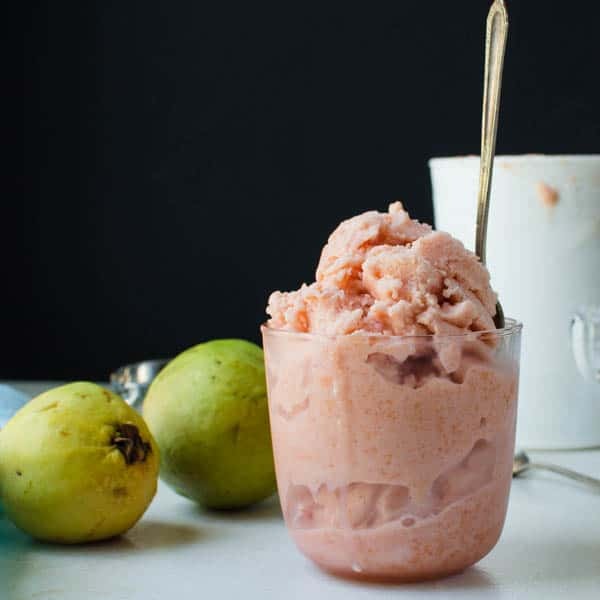 Unlike guava sorbet, this guava dessert has a bit of milk and cream for a slightly creamier mouth feel. 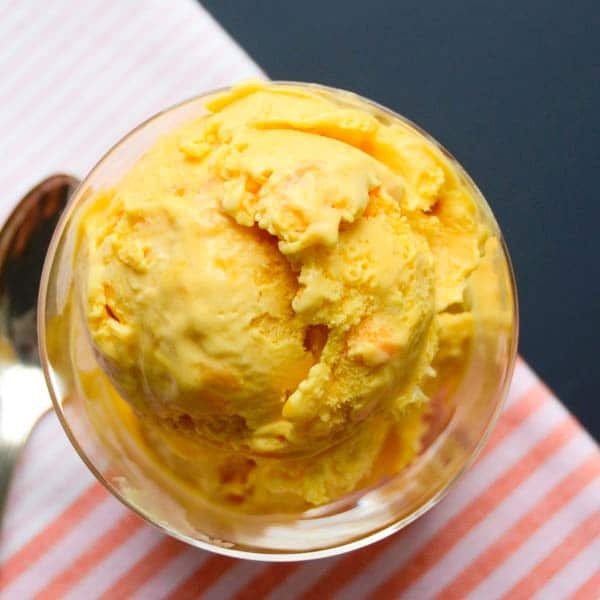 Sherbet from scratch is easy to make too. 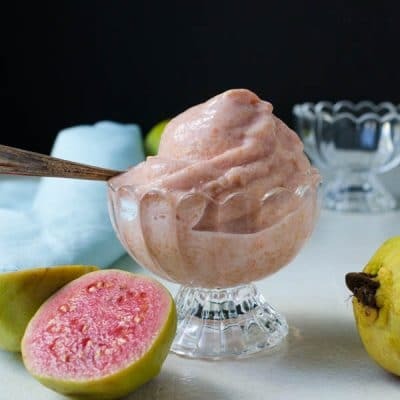 If you’re a fan of tropical desserts, like pineapple sorbet or calamondin pie, I know you’re going to love this creamy, guava-infused, homemade sherbet. The distinctive perfume of pink guavas is mellowed in a vanilla simple syrup and the resulting guava sherbet is lip-smacking good. 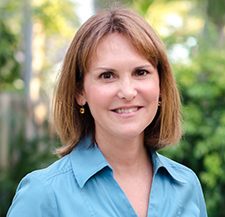 We discussed the red tide of guavas that is encroaching on my parents domicile in the Florida Keys last week. A pink guava tree that’s so heavy with fruit it will literally bend in half from the weight. It doesn’t matter how fast you pick it, more will magically sprout like Marvel Comic’s Hydra — Cut off one head, two more shall take its place. Our mission now is finding uses for that fruit. 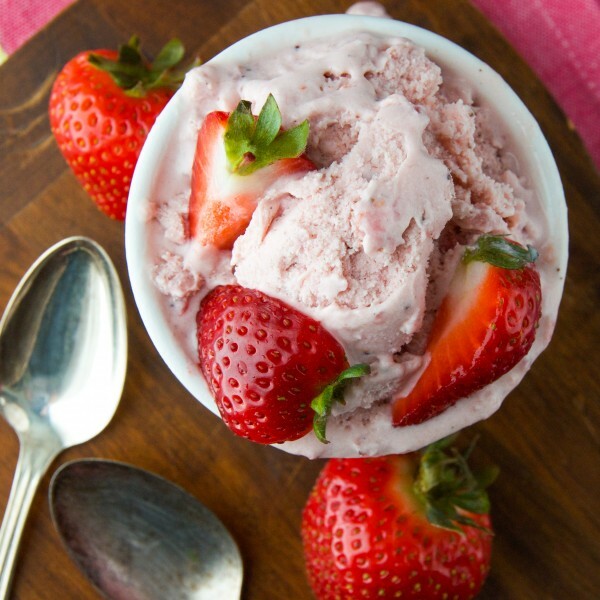 This homemade sherbet is a good one! My original idea was to make a guava sorbet — I love sorbet, but my daughter wanted something slightly richer. Not ice cream rich, but with a little more body than guava sorbet. Sherbet. 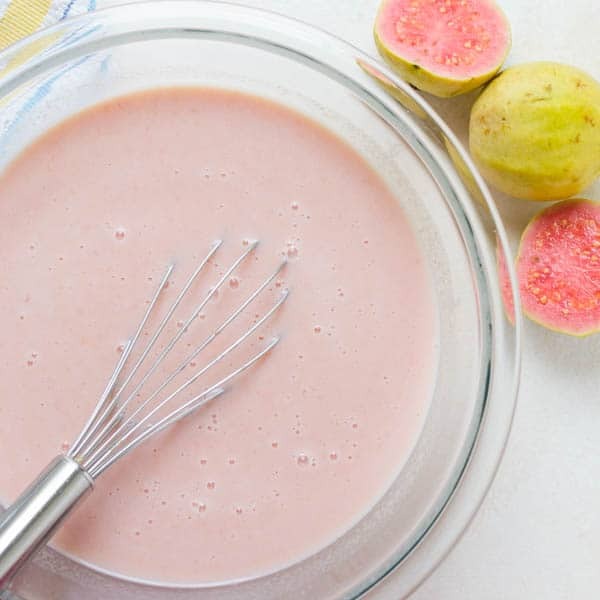 This guava dessert starts with the poached fruit from the guava syrup we made last week — as well as a little of the guava syrup itself. 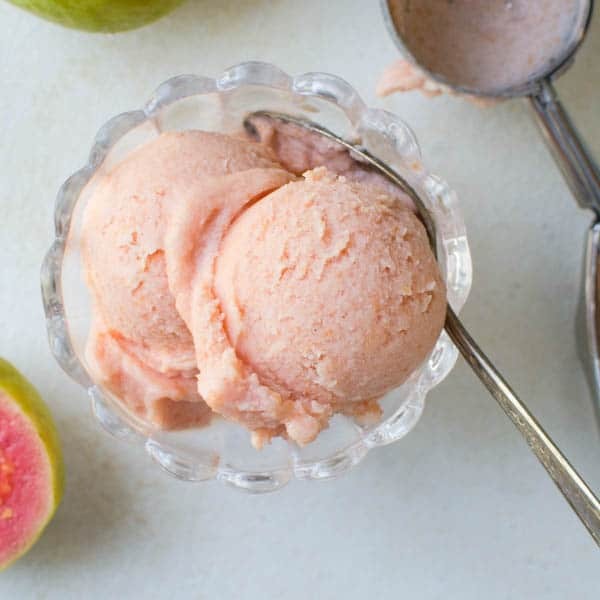 For the homemade sherbet, pulse the simmered guava in a food processor until very smooth. 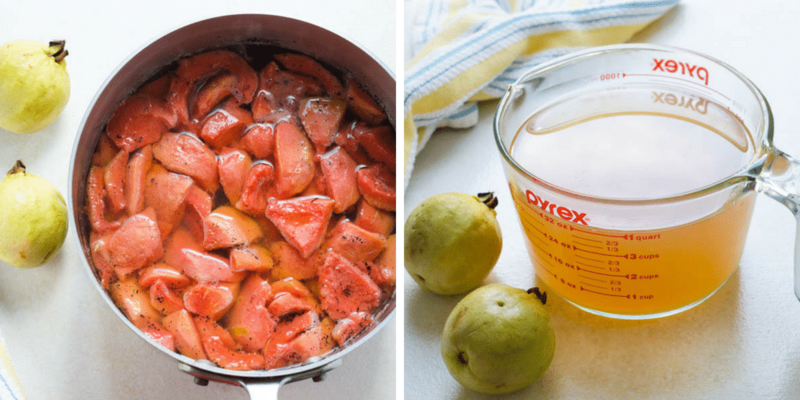 Simmer the guava with sugar, a vanilla bean, cinnamon stick and water until the guava syrup is ready. Strain the poached guava through a mesh strainer. Discard the vanilla and cinnamon stick and transfer the fruit to a food processor. Pulse until you have a smooth purée. In a large saucepan, combine milk, cream, corn syrup, sugar, salt and guava syrup. Heat until almost simmering, so that mixture is hot and sugar has dissolved. Add the guava purée to the milk mixture and stir to combine. Chill the homemade sherbet mixture for several hours or use the Quick Chill method below. Transfer the sherbet base to your ice cream maker and churn according to manufacturer’s instructions. 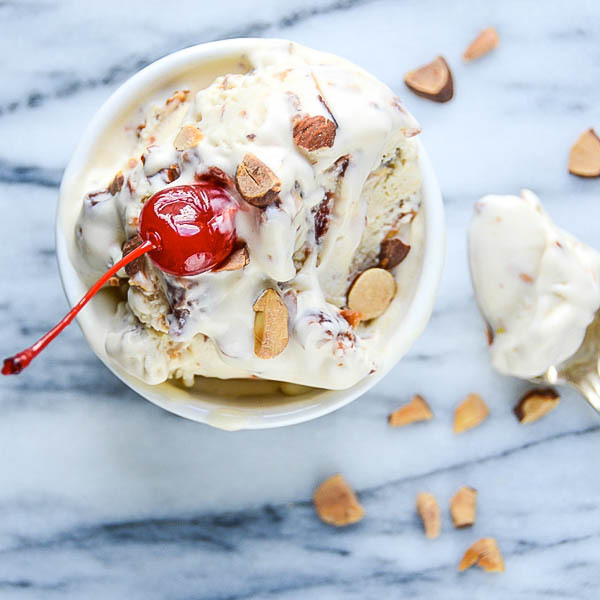 Homemade sherbet will be the consistency of soft-serve ice cream when it’s finished churning and can be eaten immediately, but for firmer sherbet, transfer the ice cream to a container, cover with plastic wrap and freeze for two hours. If the homemade sherbet is frozen overnight, let it rest on the counter for 10 minutes to make it easier to scoop. 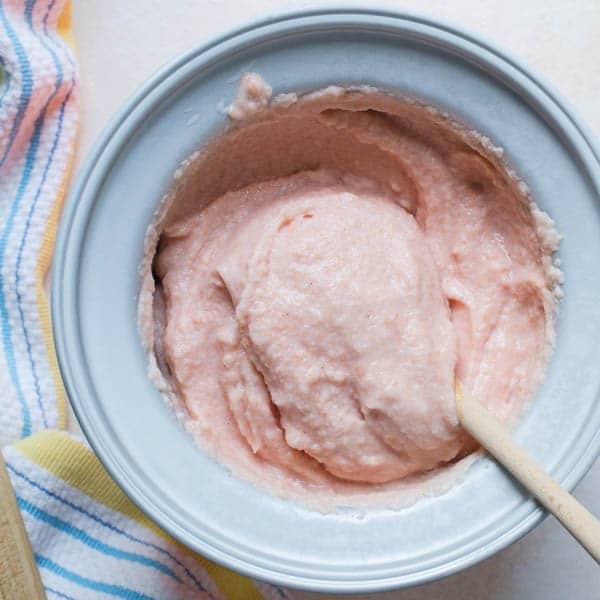 The puréed guava adds such a beautiful color to the homemade sherbet base, don’t you think? It reminds me of Easter pastels. Set up an ice bath in a large bowl. Carefully pour the warm sherbet base into a zip top freezer bag and seal shut. Place the freezer bag in the ice bath, agitating the bag every minute or so for about 5-6 minutes or until the homemade sherbet base is cold. Transfer to the ice cream maker and proceed as normal. After just 20 minutes in the ice cream machine your homemade sherbet is ready for the freezer. You can use many types of containers to store your frozen guava dessert, loaf pans or deep storage containers — just make sure to cover them with a bit of plastic wrap. I actually invested in some ice cream storage containers which work really well and help to preserve the freshness of the homemade sherbet, ice cream or guava sorbet without letting “freezer odors” seep into it. Plus they look pretty impressive. Affiliate links below. Smooth, creamy and refreshing with the tropical note of guava and vanilla. Peel the guavas with a vegetable peeler. Cut them in half, crosswise and use a spoon to scoop out the center portions of the fruit to remove the seeds. Discard the seeds. 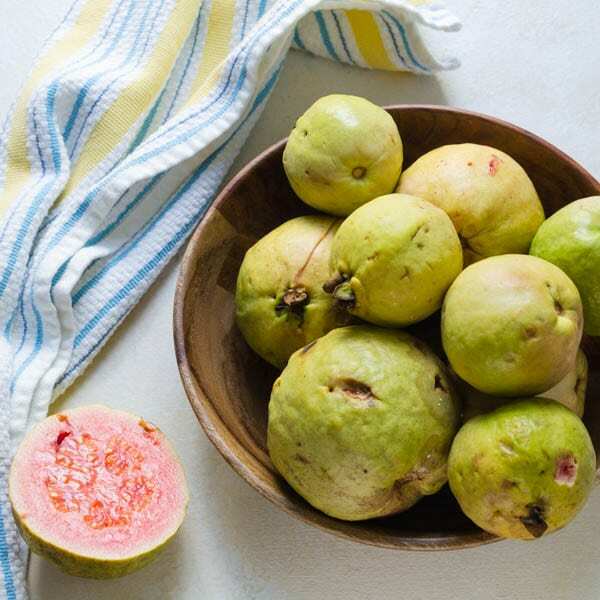 Cut the guava into 1" -2" pieces. In a large saucepan, combine the guava, sugar, water, vanilla seeds and vanilla bean as well as the cinnamon stick. Bring to a boil, then reduce heat and simmer on medium low for 15 minutes. Remove from heat and let the guava syrup steep for 20 minutes. Place a large strainer over a large bowl and carefully pour the fruit and simple syrup into the strainer. Discard the vanilla and cinnamon stick. 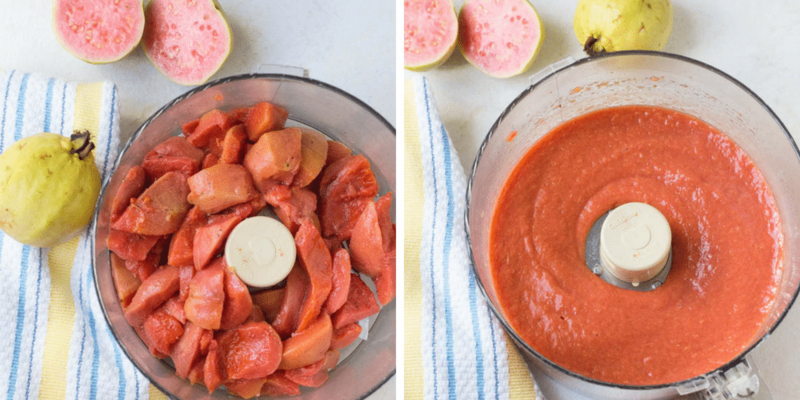 Transfer the poached guava to the bowl of a food processor. Fasten the lid and pulse several times until you have a smooth puree. Set a large sieve over a bowl and pour the puree into the sieve. Use the back of a spoon or a spatula to press the puree through the sieve. You should have about 1 1/2 cups of guava puree. Cover and refrigerate. 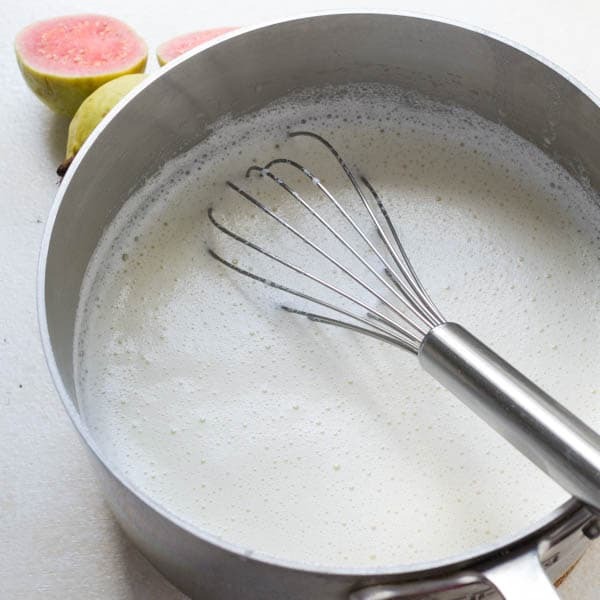 In a large saucepan, whisk together the milk, cream, guava simple syrup, corn syrup, sugar and kosher salt over medium heat. Continue whisking until the mixture almost comes to a simmer and the sugar is dissolved. Transfer the milk mixture to a 4 cup liquid measuring cup with a spout or to a large pitcher. Set aside. 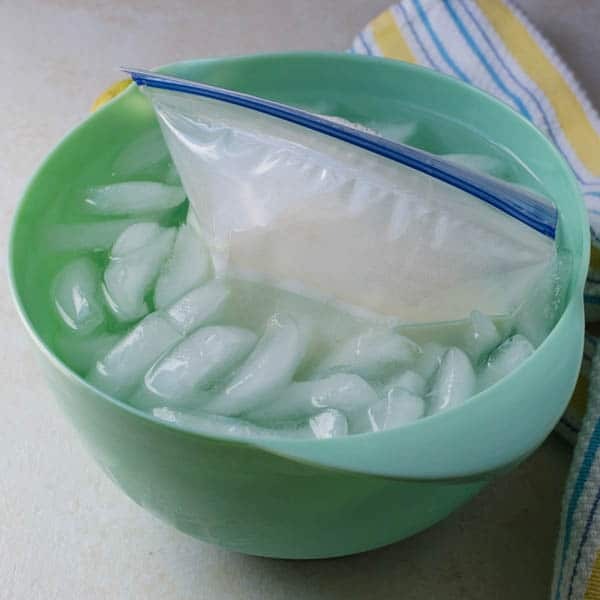 Create an ice bath in a large bowl with equal parts ice and water that fill the bowl halfway. THIS TAKES TWO PEOPLE: Have one person hold a 1 quart zip-top FREEZER BAG open, gripping tightly to keep the bag upright. The other person carefully pours the milk mixture into the bag. Seal the bag completely and immerse it in the ice bath. Agitate the bag every 5 minutes or so to ensure that it's cooling evenly. When most of the ice is melted in the ice bath and the milk mixture is cold, discard the ice water. Dry the bowl and pour the cold milk mixture into the bowl. Add the reserved guava puree and whisk until evenly combined. Cover and refrigerate at least 4 hours or overnight. When you're ready to make the sherbet, pour the guava mixture into the ice cream maker and churn according to the manufacturers instructions. Transfer the sherbet to a container and cover with plastic wrap. Freeze until scoop-able, about 2 hours. If you freeze the sherbet solid, let the sherbet sit out at room temperature for 5-10 minutes to soften slightly before scooping. Have you tried guava cheesecake since you can get guava easily. It’s divine with guava puree sauce. Out of this world. Yes, I love a good guava cheesecake — in fact, I have a guava ricotta cheesecake that I posted last year. So good. This takes me to the topics. And such a pretty color too. Yummy! Great recipe! This sherbet looks so delicious! Lisa, this sounds divvvvine! What a clever idea to use guava…something you never see enough of 🙂 Just pinned…great recipe! Glad you like it, Traci! This sherbet has such a gorgeous color! I love it! Lucky you, to have all of those guavas! Can’t wait to see what else you make with them! Oh what a fantastic idea, homemade sherbet would be a real treat for my kids and they love guava! Definitely need to give this a try.